"What do Old John Kelley, Johnny Kelley, and Bill Rodgers all have in common? They were all dropouts in their first Boston Marathons." - Bill Squires, speaking in a Boston Globe column by Bob Ryan where he says Kara Goucher has nothing to be upset about. We say her 3rd-place showing and particularly Ryan Hall's were inspiring. Americans both 3rd, what does this mean? LRC: Boston Media Day: Can An American Win It? The stars in Boston addressed the media on Friday and LetsRun.com was there to cover it all. 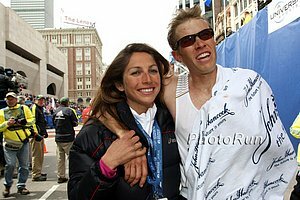 Of course we've got Ryan, Kara, and Robert the Champ but much, much more, including Ryan Hall's confidence, Kara Goucher's ability to pull a Kempainen, Kara's demons, Brian Sell's possible retirement, and even a life-sized statue of Brian Sell made out of pasta. Story and videos. Boston Media Day: Can An American Win It? 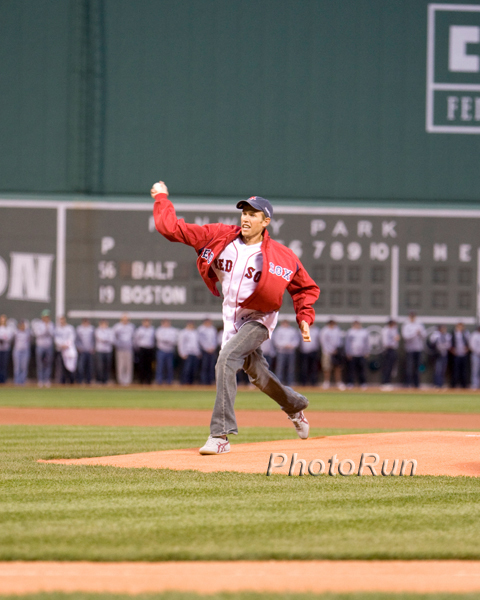 *Classic: Hall Throws out first pitch for Red Sox, does his LAST training run, and - gulp - FORGETS HIS SINGLET IN CALIFORNIA! *IAAF: Tune, Cheruiyot Cautiously Optimistic About Repeating The article reveals Cheruiyot has regularly been finishing way ahead of his training partner and the Chicago champ Evans Cheruiyot in practice. *Bill Rodgers: "There's a serious, serious chance for Americans to win the race." 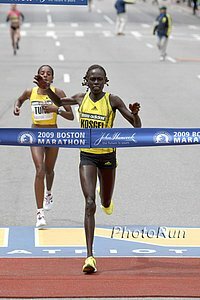 *IAAF Preview Of Boston - Cheruiyot: "Boston is my second home." *LRC Preview Of The Men's Field - Can Hall Win It? The short answer is yes but it won't be a walk in the park. *LRC: Meet Neil Cusack: The 1974 Boston Marathon Winner & Ireland's Only Boston Champion PJ Browne gives you insight into the only Irish champ in Boston. His article clearly reveals that Boston in 1974 was a totally different era. Famed television anchor Walter Cronkite interviewed the winner and the headline in the NY Daily News the day after the race was, "Irishman wins Boston, trains on beer." Cusack never reached his full athletic potential as he had to work several jobs. *Brian Sell On Where He Sees Himself And His Teammates Finishing On Monday Hansons-Brooks brought a lot of excitement to Boston with their 2006 squad. *Kevin Hanson On Hansons-Brooks And The Resurgence Of American Marathoning Hanson predicts 6 Hansons-Brooks runners in the top 15! "The six people, I think, will all finish in the top 15, 20th at the worst." *Ryan Hall Gets Front-Page Sports Feature In USA Today What a pleasant surprise to see Hall featured in the paper yesterday morning. *Kara Goucher Gets Some Love From USA Today Salazar says Goucher's much better prepared than for New York as she's had 9 100-mile weeks. Brian Sell also gets some love. *Can A Tall Blonde Surfer Guy Runner Win The Boston Marathon? *David Monti/Universal Sports Preview Boston They have a picture of the bibs some of the top runners will wear. *Man To Run Boston Marathon 4 Times Consecutively Raising money for wounded soldiers. *adidas Extends Boston Marathon Sponsorship Conspiracy theorists thinking Nike is buying Kara Goucher's victory should think again. 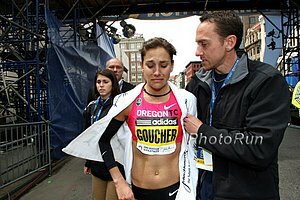 *Video Interview With Kara Goucher The best part is you get to watch her run on the Alter-G Treadmill ... it looks really strange. *Science Of Sport Previews The Men's Field In Boston A great analysis of Robert Kipkoech Cheruiyot's winning strategy last year and predictions for this year. *British Column: Bolt's Apology Unnecessary "The 'news' that Usain Bolt recently admitted to knowing as a child how to roll a joint belongs in the same category as the fact that bears defecate in woods." *Usain Bolt Answers Readers Questions On Video In Britain He's #1 rule to being a champion, "Listen to my coach." He also takes a question at the end from a guy who claims to have walked him down in HS. *Brit Marlon Devonish To Face Bolt In Next Month's Street Race He ran a 10.11 last week. All we can say is that will look like an 11.00 next to Bolt. *LRC' Post-Race Comments/Interviews: We give you some our thoughts and extensive interviews with Goucher/Hall, etc. 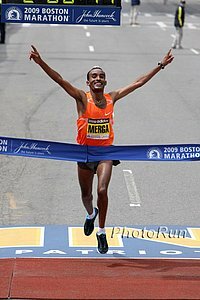 We upset a lot of old timers who come to LetsRun.com, urge the BAA to pay Deriba Merga $10,000 to take English classes, and do the more traditioanl like give our take on the races. LRC: The Week That WasPrior to Boston, a lot happened in the world of running and we try to make sense of it all - from Alan Webb's outdoor debut, to Mt. SAC, to debutante marathoners in Vienna, to dopers possibly going to jail. Oregon Going For 4 x Mile Records - Good Trivia: What Are The World, Collegiate And American 4 x Mile Records? We were arguing about this at track practice today. USATF Announces Fantasy Track And Field Get your office league ready! The winner takes home $2,000.00 and a Nike spike bag. USATF Chief Executive Officer Doug Logan Ironically Blogs About The Demise Of Fat Cats It's a little bit funny to hear a CEO bash fat cats. 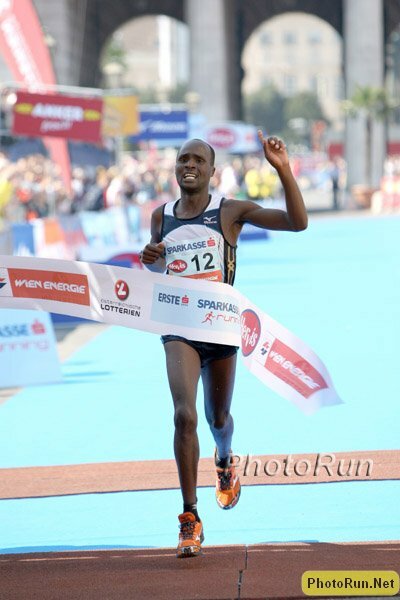 Gilbert Kipruto Kirwa Debuts In 2:08:21 Vienna Win Photo Gallery *Race Recap Austrian marathon record on the women's side as hometowner gets the win, great debuts on the men's side (4 under 2:10). Men's winner says, "After this debut I hope to run 2:04 one day." Rotterdam and Paris have everyone Kenyan thinking they can run 2:04. 2000 Olympic Steeple Champ Reuben Kosgei dropped out of his first marathon. Recommended Watch BBC Goes To Jamaica And Looks At Usain Bolt's Upbringing See his elementary school, his dirt track, and his father wearing a Barack Obama hat. *San Diego Tribune: Chambers running for the sake of running. Chambers ran in anonymity in LA, as the announcer didn't even announce the fact he was on the B 4 x 100. BAA Road Miles: Darren Brown Surprises, Anna Willard Confirms Again She's a Really Good Miler Darren Brown did something very unfamiliar on Sunday - win a race. He got used to being beaten in high school and college but got a very big win on Sunday. Anna Willard did something she is growing accustomed to - winning. She easily dispatched Olympic 10k bronze medallist Shalane Flanagan on the streets of Boston. Photos, video, and more. *Videos With No Announcing The Mt. SAC PA announcers are some of the best in the business.